If you’re reading this website then there’s every chance that you’ve complained about what’s happening with Vancouver Whitecaps at some point in the last year or so, especially earlier this season when the team hit a poor run of form. Why don’t ownership spend money to bring top talent here? Can the team compete in a vastly changing MLS where money is being splashed around? Is Greg Kerfoot looking to sell? What was behind the decision to get rid of WFC2 and how do our young players get developed now? Why don’t the top Residency players break into the Whitecaps first team? How long can you keep Alphonso Davies here? Will the money from his sale be put back into the team? Why are the front office so cheap? Where’s the ambition? These are just a fraction of the moans and gripes that regular followers of the online Whitecapsland will have heard this past year. There’s always so many questions, but where are the answers? Well on Tuesday evening you’ll get the chance to get some. 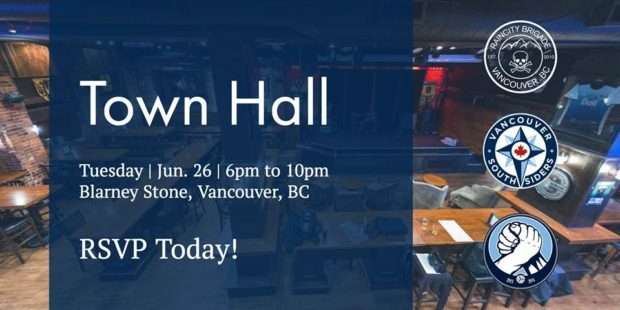 Vancouver Southsiders, in conjunction with fellow supporters groups Curva Collective and Rain City Brigade, are putting on a Town Hall at the Blarney Stone on Carrall Street in Vancouver, giving supporters of a MLS team a rare chance to not just quiz the manager, but also members of the front office and an owner. Carl Robinson will be there representing the team; Bobby Lenarduzzi, Greg Anderson and Rachel Lewis will be there from the front office; and perhaps the jewel in the crown is owner Jeff Mallett will also be in attendance. This is your chance to ask the questions you’ve wanted answered for a long time in a two hour moderated meeting (I will be one of the moderators). Those in attendance have said that they plan to be candid and answer all the questions put to them. You may not like what the answers are, but they will answer them, and there will be no video or audio from the event so this is your one chance to hear it. There’s not many clubs around MLS where supporters get this kind of access, so it’s important to make sure that the event is a sell out and to show the passion for the club amongst the fanbase. “This is your chance to have your voices heard by the people who are at the top, making the decisions for OUR Club,” Southsiders President Aaryn Vivian explained. “I implore each of you who have something to say to the front office, whether it be a question about the organization or a statement (good, bad, or ugly) about your experience as a supporter / season ticket holder / fan / partner, etc. to come out and make your voice heard this upcoming Tuesday. The event kicks off at 7pm on Tuesday evening at the Blarney Stone. Tickets cost $5 ($5.50 after card processing fees) and are available HERE. All proceeds from the event are being donated to the Vancouver Street Soccer League. So come out and get your voice heard. I have problems with the ownership of the team but I’ll give credit where credit is due. Good on the VWFC for the town hall meeting. I relocated to Edmonton so I will not be able to attend but answers to the questions posed at the top of this article would be appreciated.